FOR IMMEDIATE RELEASE – August 14, 2015, Los Angeles, CA: Comedian Eric Schwartz has relaunched his website, EricSchwartzLive.com, with a multimedia-meets-comedy theme he calls MultiComedia. Schwartz is a comedian known to push the boundaries of traditional stand-up, incorporating musical comedy, physical comedy and visual presentations to create one of the most entertaining live shows around. Now, his digital presence is a reflection of his fun live vibe. 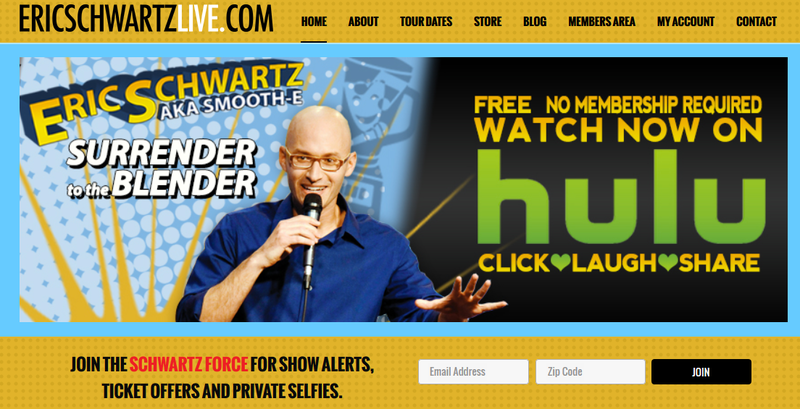 The newly redesigned home page offers a site summary, including tour dates, blog, comedy clips and parody videos. The revamped store offers downloads of his comedy songs and funny t-shirts based on his stand up. Fans can join the Schwartz Force for special ticket offers and show alerts. The biggest addition to the site is the Members Area, which offers “Schwartz Force Elite” super fans access to a treasure trove of exclusive, behind-the-scenes content and unreleased material. The membership also includes a signed poster, first access to free comedy show passes, an exclusive Schwartz Force T-shirt and invitations to meet and greets after shows. The unlikely beginnings for this musical comedian began in the humble suburbs of Thousand Oaks, CA, where he first foisted his unique brand of rap comedy humor on his brave parents and peers. Eric began to gain notoriety as a pioneer content creator as his viral videos and music parodies hit millions of views, even before YouTube existed. He has since scored appearances on The Tonight Show, Showtime, Comics Unleashed, E!, BET Comic View, Chocolate Sundaes Live on the Sunset Strip, Mun2 and many more. He was the host of the syndicated show “On The Spot” and his one-hour special, “Surrender to the Blender” is streaming on Hulu. He performs at comedy clubs across the country and is a regular at A-list clubs like the Laugh Factory and Improv. Visit Eric’s website, check his tour dates and connect with him on Twitter, Facebook and Instagram. Email [email protected] to book an interview or appearance.